Love jambalaya? 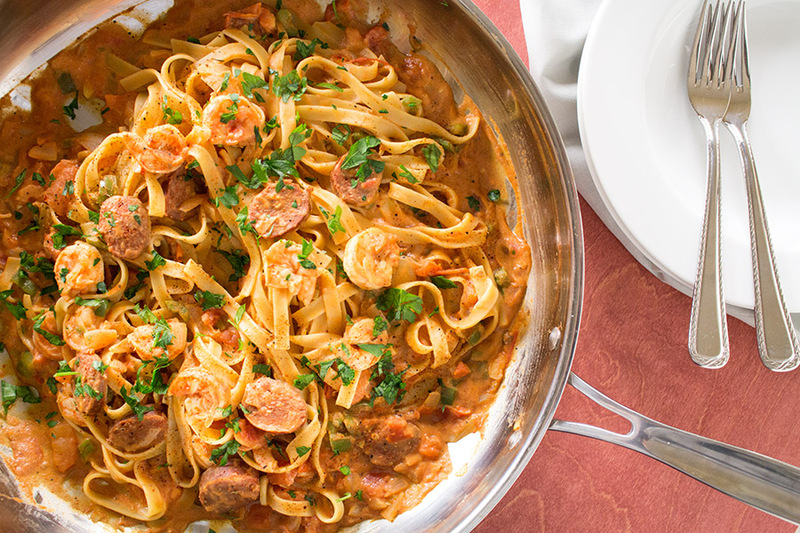 This recipe brings all of your favorite jambalaya flavors and transforms them into a tasty pasta dish. Patty and I both go a little crazy over Cajun flavors. Such powerful food when it comes to flavor. The seasonings blends are potent and can truly liven up any type of a dish. After making the Creamy Taco Style Pasta recently, and seriously LOVING it, I thought — How might that concept work with Cajun flavors? The answer is DANG GREAT. 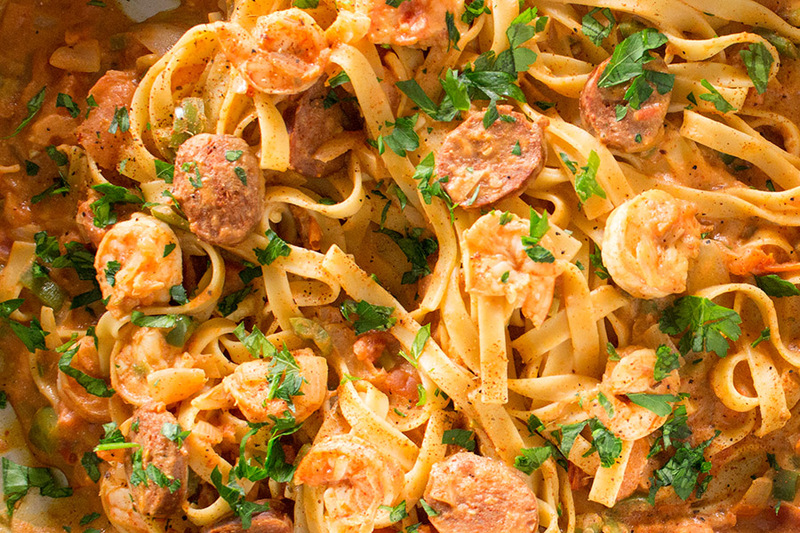 If you enjoy jambalaya, you’ll enjoy this recipe that brings all of those flavors and tosses them up into a big bowl of pasta. Another great thing about this recipe is that it is FAST. Yep. Quick and Easy, ideal for lunch or dinner in a hurry. Of course you can leave the sauce to cook and simmer awhile to let the ingredients mingle and develop with even MORE flavor, but this hit that sweet spot I was looking for without any additional time. It has a nice level of spice from my Homemade Cajun Seasoning blend as well. Vary up the type of pasta with your favorite kind. I used fettuccine noodles, but this works with pretty much anything. 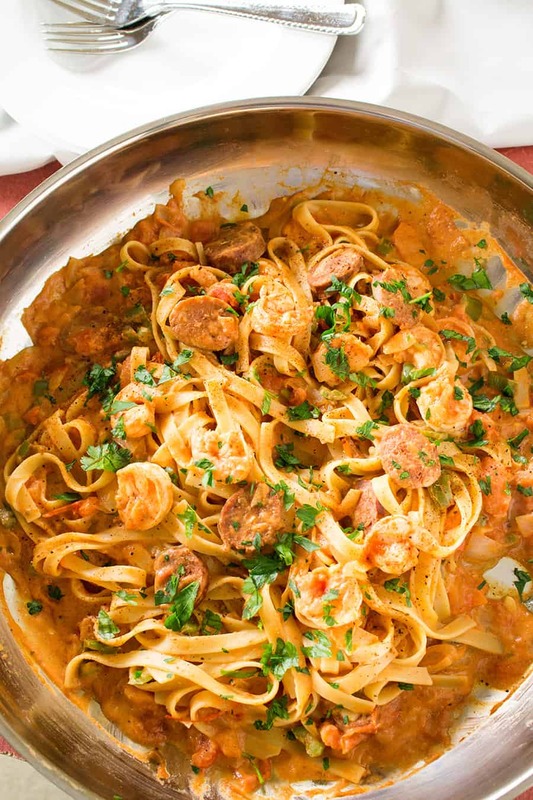 It’s important to incorporate both shrimp and sausage to truly get the flavors we’re going for, but maybe some crawfish would be nice as well, or even a seafood version. Hmmm. The old wheels are turning upstairs now! Variations abound. We loved it! I hope you do, too. And if you love jambalaya, try our Seriously Awesome Jambalaya Recipe. Heat a large pan to medium heat. Add onion and peppers with olive oil and cook about 6-7 minutes to soften, stirring occasionally. Add garlic, tomatoes and sausage and cook another couple minutes. Add shrimp and Cajun seasonings and stir. Cook about 3-4 minutes, or until shrimp cook through. Add tomato sauce and stir to incorporate. Reduce heat to a low simmer. Get your pasta cooking in a large pot of salted water. It should only take 10 minutes to cook. Remove the large pan from the heat and stir in the sour cream or crema. Drain pasta and stir it into the sauce with the shrimp and smoked sausage. Heat Factor: Medium. The jalapenos will give you a bit of a kick. If you'd like to increase the heat, sprinkle on some spicy chili flakes or add in some hot sauce to the mix. This recipe looks awesome. Big question, how many does this recipe serve ?? I have a family of four. REPLY: Thanks, Brian. This recipe serves 2-4, though it can easily be upscaled. — Mike from Chili Pepper Madness. I’m gonna do this tonight but sub chicken for the proteins… Look so yummy. How many does this recipe serve ? REPLY: Brian, this will serve 2-4 people. — Mike from Chili Pepper Madness. Do you add the sour cream to the fettuccine while the water, or do you drain and then add sour cream? REPLY: Casey, drain the pasta first. Add the sour cream or crema to the pan and stir, then add in the drained pasta. — Mike from Chili Pepper Madness. I made this with very few changes and doubled it. What a great recipe! Going to get some crusty french bread for leftovers tomorrow.. Only added ingredients was one chicken buillon, finishing with parmesan and I put dried chives. We didn’t to the parsley garnish but only because we forgot it on the shopping list. Thanks so much. I love it. I have to post my simple crawfish and or shrimp easy creole sometime. REPLY: Super happy it turned out! — Mike from Chili Pepper Madness. This looks “Rock Star“ good Mike. I love all things Cajun & this is right up my alley! Going on my to make list really soon. Like tonight! Keep coming with the awesome recipes! REPLY: ROCK ON!!! — Mike from Chili Pepper Madness. I think I’d change my middle name to “cajun pasta” if I could. Honestly, my obsession is getting out of hand. But I don’t think that’s enough to keep me from trying this recipe… Looks amazing! That is so awesome. Me too!